As you are probably aware, a lot of people are beginning to access the Internet using various mobile devices other than the regular desktop PCs and laptops today. Such devices may include tablets, smartphones, MP3/4 players etc. The screen sizes of most of these devices are usually much smaller as compared to those of the standard PCs and laptops. In light of the fact that the Web has been around far longer than the mobile devices, the conventional web design structure and methods were naturally not evolved to accommodate display of the websites on such devices with small screens. Due to this, most of the old and traditionally designed websites do not display properly on non-PC devices, as you might have observed personally in the past. As a matter of fact, according to a report released by the technology market research firm comScore, for the first time in the history of the Internet, mobile-based Internet usage in the US exceed PC-based usage in January 2014. Further market research indicates that this trend is only going to rise in the future. In this scenario, it is obvious that if your business website fails to work properly on mobile devices, you are losing significant numbers of visitors and potential customers. This is precisely where the technique of responsive web design comes into play. 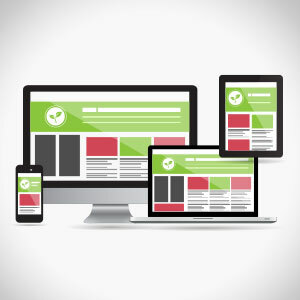 Responsive web design is a method of designing websites so that they display and work well with any type of access devices, no matter what their screen size/resolution and user interface. Not all web design agencies are capable of creating responsive sites. Therefore, if you’re planning to hire the services of a web design firm, you should check their responsive design capabilities too. Lucky for you, you are already on a web design site that does fully responsive designs for its customers!